An essential technique for any Cake Designer to master. 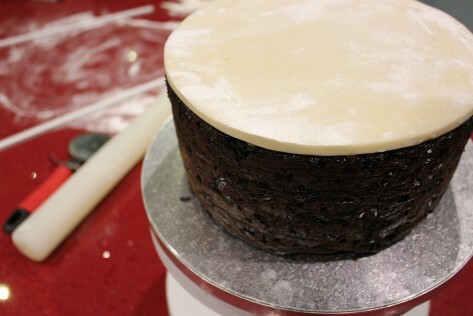 My process for marzipanning a cake is carried out in two halves to create a perfectly crisp top edge, perfect for the final layer of sugarpaste icing. Think about your marzipan layer as a set of really good shaping underwear for your cake – if you want the icing to be smooth and straight, you need to get the marzipan right. Whether you only plan to do this once a year at Christmas, or all year round for Traditional Wedding Cakes, this is the method that I use all the time and it works wonders for me. 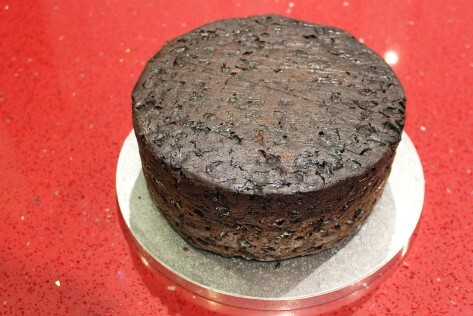 Start by flipping your fruit cake over so that the bottom of the cake is now the top. You will find that this gives you an instant flat top to work with! If your cake has risen in the oven to a peak (which is normal), you may find that this is best sliced off with a sharp knife to give you a flat bottom surface too. Heat 3-4 dessert spoonfuls of Apricot Jam in a bowl in the microwave for 30-60 seconds until warm. Jam is much easier to spread when it is a little warmed through. 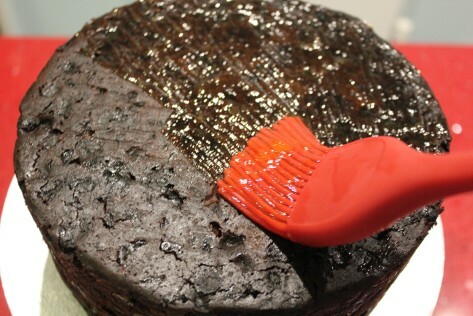 Brush the top of your cake with jam. Roll out 500g of marzipan on a surface liberally dusted with icing sugar – whenever you are working with fruitcake and marzipan, you will need to use icing sugar rather than cornflour. 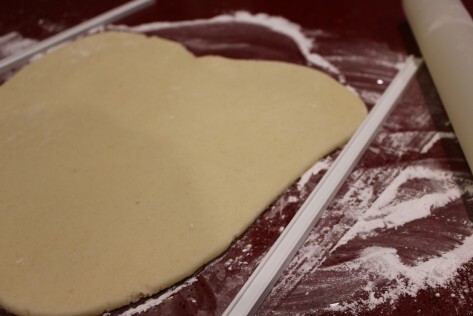 Use marzipan spacers to ensure an even thickness and a non-stick rolling pin for sanity. You will need to roll sufficient marzipan for the top of your cake. 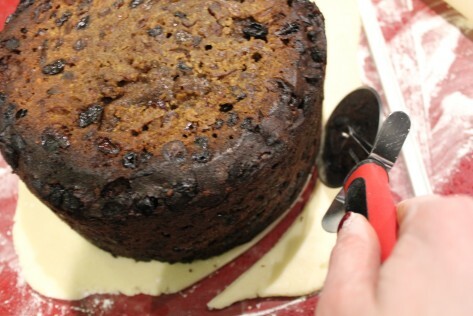 Place your fruit cake, jam covered side down, on top of your rolled out marzipan. Use a pizza wheel to cut around the cake. This is a trick that I picked up from Fanny Cradock (though she did not have a pizza wheel!) and is the absolute easiest way to perfectly cover the top of your cake. Return your cake to its board, the right way up, and brush the sides with Apricot Jam. Roll out the remaining marzipan into one long strip, high enough to cover the sides of your cake from bottom to above the top. 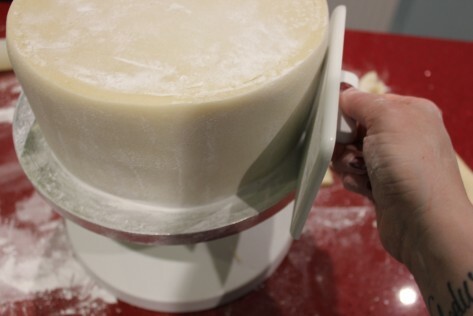 Use the marzipan spacers to ensure that this marzipan is an equal thickness to the marzipan on top of your cake. Trim along one edge with a pizza wheel to create one straight edge. You should also trim away the very ends of this strip as they are likely to be a little heavier than the rest of the marzipan. Carefully wrap the strip of marzipan around your cake, with the straight edge laid flush against the board. The whole thing should resemble one of those hand-raised pork pies! Gently press and smooth the marzipan to ensure that it is sticking to the cake. The trick to trimming this strip of marzipan is to cut through where the two ends are overlapping. 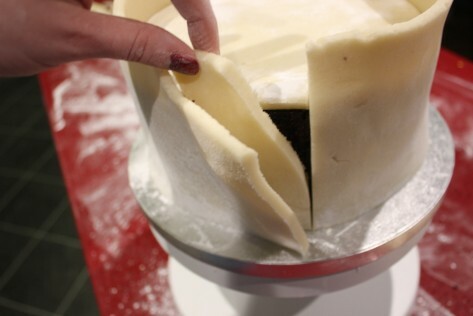 Cut straight down from top to bottom and remove the excess from the overlapping marzipan, then remove the excess from underneath the overlap (as shown). This gives you two perfectly straight edges to smooth together. 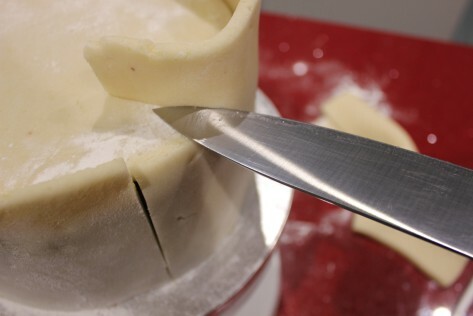 Use a very sharp knife to trim the top edges of the marzipan. 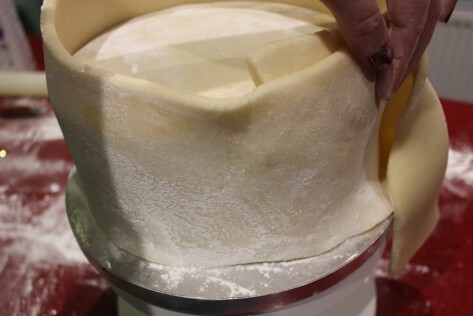 Lay the blade of the knife flat against the top layer of marzipan and slowly cut in towards the middle of the cake. 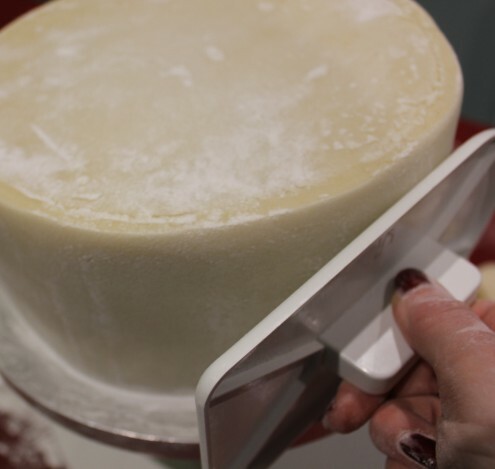 If you pull the blade out towards the edges of the cake, the marzipan will pull away from the cake and make a mess – always cut in towards the middle. Any excess can be stored in any airtight container and used to make decorations for around 2 weeks. 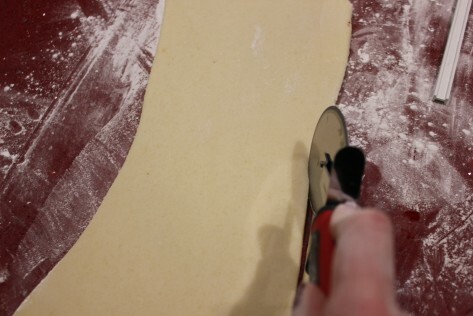 Use a straight-edge smoother to straighten the marzipan. You are aiming for straight sides, a level top, and nice sharp top edges. You will need to leave the covered cake for 48 hours before covering this in sugarpaste. Store the cake in a cardboard cake box, never an airtight container, as the marzipan later needs to dry.